The Frog Road 67 is a lighter weight, better equipped 24-inch-wheel road bike for youngsters from around 8-12 years old from a brilliant British bicycle company. '67' means this bike fits youngsters with a 67cm / 26.5-inch (or longer) inside leg measurement. Like most better-quality adult bikes, Frog bikes are built with aluminium frames and (mostly) aluminium parts to keep the weight to a minimum to help ensure your child enjoys the best possible introduction to biking. Sure, more and more companies are making kids' bikes with alloy (rather than heavier steel) frames and wheel rims. This Frog bike stands out for coming equipped with all-aluminium alloy forks, hubs, crankset, cantilever brakes, brake levers, handlebars and seatpost to keep the bike's weight to a minimum. To make the bike suitable for gradients it comes with 9-speed gears via its Microshift gear shifter, Microshift derailleur and Shimano 9-speed cassette. To make it simpler for youngsters, it comes with just one shifter, one chainring and one derailleur. The Microshift shifter is integrated with the right-hand brake lever in a Shimano STI dual control style. Simply nudge the silver brake lever inwards to shift into a lower gear, or click the black return lever inwards to shift to a higher gear. It's worth pointing out that opting for Microshift over a Shimano shifter was not a cheap option. Frog spec'd this shifter (which retails for over £100) because it's at least as good as Shimano Claris in quality, and because it has the shortest-reach brake lever (measured from lever blade to handlebar) and the shortest gear change 'sweep', making it the best dual control shifter on the market for riders with smaller hands. Frog designed their own unique bar, which is the correct width, appropriate to a small rider's shoulder width, and with minimum drop to make it easier for the young rider to switch hand position. The Tektro Oryx cantilever brakes (which we have seen gracing £1,000 adult cross bikes and touring bikes) can be applied from the Microshift child-friendly drop bar levers. The Frog Road 70 also comes with a set of Tektro auxiliary levers that enable the rider to pull the brakes when riding with their hands comfortably perched on the bar tops. Another original detail rarely seen on kids' bikes is that the Frog Road 67 comes with lightweight alloy quick release wheels fitted with good quality Kenda 24 x 1 1/8 inch road tyres, making this bike capable of sprinting and accelerating - just like an adult road bike. Also, with cyclocross conversion in mind, Frog have internally routed the rear brake cable inside the frame so the cable doesn't dig in when the rider shoulders the bike. Another example of Frog's original approach: rather than naming their kids' bikes by wheel size, Frog size their bikes by inside leg measurement. Hence the Frog Road 67 is recommended for children with a minimum inside leg measurement of 67cm (26.5 inches). This corresponds with other manufacturers' 24 inch wheel road bikes for youths, so the Frog 67 would make a great present for children from around 8-12 year olds. It comes with a long aluminium seatpost with a quick release seat binder to make it easy to adjust the saddle as the child grows. Quick release (no need to carry a spanner to change a tube) aluminium wheels. The Prowheel alloy cranks are a child-friendly short (127mm) length with 34t chainring. Child friendly 34cm-wide short-drop alloy handlebars. 'Short drop' means a shorter distance between the bar tops and the drops than you'd find with adult drop bars to make it easier for the young rider to switch hand position. Minimum recommended inside leg measurement to the floor: 67cm. Approximate age range: from 8/12 year old. Frog are kids' bike specialists. That's all they produce. Their kids' range isn't an afterthought. It's their reason to be. 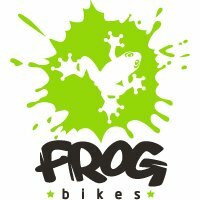 Frog are a British company who have revolutionised our expectations of what we have come to expect from children's bike since their launch in season 2013/14. Frog's winning formula is to create lighter weight, better spec'd, better designed kids' bikes at prices that are competitive with their closest rivals. This formula of creating lighter weight, more intelligently designed kids' bikes has obviously been a success with our customers because within a year of their launch, Frog bikes have firmly established themselves as our best selling children's bikes.